Ya know what? It takes some real balls to turn this joke into a T-shirt. I mean, it’s not like a T-shirt is an infinitely lasting thing that fits with the subject. But anyone who takes the time to read the joke will seem to be staring at your chest for an infinite amount of time. 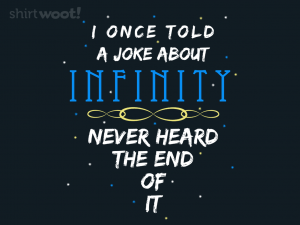 Of course, that infinity is just an illusion, ’cause it’ll really just be a matter of seconds until they look up away from your shirt and into your face with a stony stare of disappointment. The kind of disappointment that doesn’t matter because your T-shirt just made a great joke and you’re proud of it. Wrap this cloth around your torso if you’re a fan of wordplay.